Last Friday, we made a powerful statement to the W3C by delivering the verified signatures of over 22,500 people against Encrypted Media Extensions (EME), Big Media's proposal to incorporate DRM support into HTML. Today the W3C advanced EME one step further in their approval process, to "first public working draft." This doesn't mean we've lost, but it shows that the media and software companies behind EME are not giving up, and that we need to keep pushing. We published a press release today condemning W3C's move and promising to release an in-depth rebuttal to the shallow arguments that W3C CEO Jim Jaffe is using as justification for EME. Donate to Defective by Design through the FSF. $15 or $30 is enough to help fuel our growing campaigns team and keep us on the offensive against the well-funded corporate lobbyists gunning for DRM. Join the W3C's public discussion list for EME and make your opinion heard. Follow this link and click "[subscribe to this list]" in the "Mail actions" line. You can also join the W3C's Restricted Media Community Group. Remember, calm but strong statements are more powerful than nasty criticism. For inspiration, check out the the joint letter Defective by Design and 26 other organizations wrote against EME. This is shaping up to be one of the biggest disputes in the W3C's history, and for good reason. 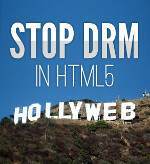 Incorporating DRM support into HTML would cause a lot of problems for users of the Web, from damaged software freedom to even more accessibility problems for users with disabilities. That's why we are going to keep finding ways to show the W3C that they need to represent the Web-using public, not just Netflix. Please donate and join the discussion list.